Today 98 British hairdressers from all corners of the United Kingdom wake up to the happy news of their finalist status in HJ’s British Hairdressing Awards. Among these finalists are stylists from the area’s very own Ashley Gamble in Shifnal. Stephanie and Ashley Gamble have finalised for both Midlands Hairdresser of the Year and Schwarzkopf Professional British Colour Technician of the Year and Olivia Nevill for Newcomer of the Year. This is no small feat with the 2017 awards attracting hundreds of entries which take the form of photographic collections. The 75 first-round judges drawn from industry experts, hairdressing icons from across the globe as well as session stylists to the stars and creative leaders, viewed the UK’s biggest photographic award exhibition display. Hairdressing is big business in Britain, with more than 40,000 salon businesses contributing more than £7bn to the national economy and employing some 500,000 people nationwide. These awards seek to celebrate the very best of those hairdressers, awarding them for their artistic flair and technical skill. The British Hairdressing Awards have launched the careers of a host of household names: from TIGI founder Anthony Mascolo to TONI&GUY creative director Sacha Mascolo-Tarbuck, as well as TV favourites Lisa Shepherd and Andrew Barton. The Midlands, Newcomer and Schwarzkopf Professional British Colour Technician of the Year categories seek to recognise the most inspiring stylists in the region, catapulting the finalists into the upper echelons of the nation’s very best hairdressing talent. A win can well and truly put a stylist on the map, securing their place not just as a creative visionary, but also as a local authority. The winners of these and the 14 other categories including the prized British Hairdresser of the Year title are all to be announced at The British Hairdressing Awards which takes place at the Grosvenor House Hotel, a J W Marriott Hotel, in London on Monday 27 November. For more than 30 years, the British Hairdressing Awards have been the most coveted and sought after titles in the hairdressing industry resulting in global recognition. Both regional and category specific awards are given to salons and hairdressers across the UK who show incredible skill, vision and talent through a collection of images. 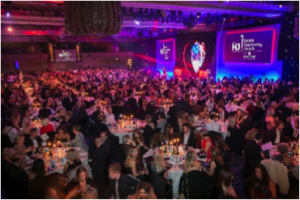 Winners will be announced at a celebrity hosted ceremony on 27th November at the Grosvenor House Hotel, a J W Marriott Hotel in London’s prestigious Park Lane. Olivia Nevill, Newcomer of the Year!